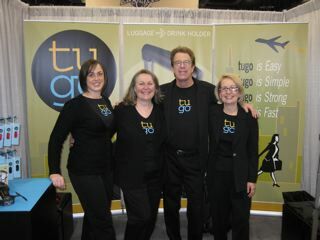 The 2009 Travel Goods Show, presented by the Travel Goods Association at the Las Vegas Convention Center March 3-5, 2009, was the official “launch” of the tugo! We were located in the New Exhibitors Pavilion so all the folks in the surrounding booths were also newbies, although many had been to other shows before. We had no idea what to expect and were a bit nervous, but quickly felt like a part of the travel family because everyone was so friendly and excited for us to be “launching” at the show. Seeing all the products available was quite entertaining; each time I took a trip to the coffee bar I took a different route to see all there was being offered at the show. I didn’t need to go far for my favorite item by far, my new purse from MY oilcloth. Across the aisle, Michelle and Yvette (MY, get it?!) were from the Boston area and barely made it to the show because of the bad weather out east. They were extremely nice and gave us lots of tips and made us feel really comfortable. 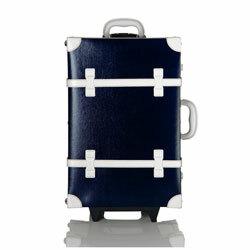 But best of all, the bags they sell are CUTE as well as WATERPROOF (I live in Oregon), being they are made of oilcloth. "Can't hold your water? We'll hold it for you." MY bag that I can set over the lip of the table in the restaurant so that I don’t have to put my new purse on the floor. Spare Soles are basically fold-up, thin ballet slippers that you can stash anywhere. They recommended them as an alternative to bare feet for when you go out on the town and your shoes hurt so badly you can’t wear them anymore. My plan (as I don’t find myself in the former situation very often) is to keep them in the car for when I visit friends with hardwood floors to keep my feet warm. A waterbottle holder with carabiner clip from Boleo called “Hold Your Water” with a pretty darn cute logo (at right). For my sweetie: a clip-on, super-bright LED light from Pelican. He was thrilled and is already planning to get them for all his friends. The majority of the booths featured luggage of all shapes and sizes. I wasn’t in the market for new luggage, as my budget for the trip consisted mainly of a small amount of cash for the slots the night after the show finished. I tried not to look too closely at the luggage, but if I could have I would have picked the Steamer Rolling Suitcase from Toss Designs at left. Darling! Ted, the licensed acupuncturist and herbalist, lived down the aisle from us and had his Jet Lag Formula on display. I didn’t try it, since Oregon is in the same time zone as Vegas, but I would certainly use it if I was going on a vacation to, say, Greece (my dream trip!). The Travel Nook inflatable pillow includes a cushion on either side of your head to prevent your head from lolling onto your neighbor’s shoulder. Because it has no padding behind the neck it eliminates the main complaint I have about typical travel pillows. Who knew that there would be this much fun stuff?! I certainly didn’t expect it, but I’m already looking forward to seeing what they have next year.